In the spring of 2014 Town Council rezoned the Ephesus-Fordham Renewal area to Form-based Code. The rezoning will help to stimulate development in one of our oldest and largest commercial areas around the intersection of Ephesus Church Road and US 15-501 or Fordham, the northern gateway to Chapel Hill. 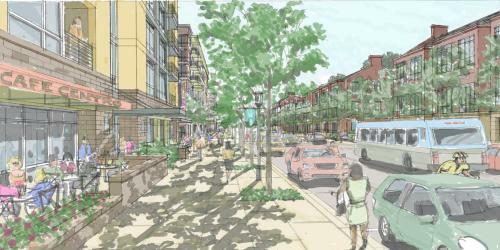 The proposal calls to renew an area well known for its confusing intersections, vast parking lots and traffic jams into a thriving walkable district with an urban character attractive to younger generations that will live and work in Chapel Hill. It hinges on adoption of a new zoning model to stimulate the development that will grow a tax base to fund about $10 million in transportation improvements -- and some stormwater benefits. Guided by the Ephesus Church Road-Fordham Small Area Plan, the proposal also includes an affordable housing development. After Downtown and Glen Lennox, the Ephesus-Fordham area comprises our oldest shopping hubs – Eastgate in 1958, Village Plaza in 1974 and Rams Plaza in 1982. Of the 130 acres of shopping sprawl in this area, only about half an acre counts as green/parks space. Of the total 190 acre area, the majority of land is commercial. But there has been scant new development or redevelopment in the past 10 years – in fact, only two development applications were received for the Starbucks at Eastgate and the Advance Auto Parts. Some of the issue isthe lengthy and uncertain outcomes for major projects going through the Town’s development review process. In 2012, the Town began exploring “form-based codes,” a new zoning model that would help convert the area into a vibrant neighborhood and business district safe for walking, cycling or using public transit. This change in zoning was adopted as a part of the Implementation of the original Small Area Plan. Using form-based codes the Council will set parameters for development including building height, setbacks and parking guidelines for each zone. With the parameters in place, individual developers will not need to bring proposed projects before the Council if they meet the established criteria. The Community Design Commission would approve building materials and architectural features once the staff approves technical elements of the development proposal. There would be a maximum building height of seven stories (90 feet) at the core of the district and tiers down to five stories (60 feet) and three stories (45 feet) on edges that abut adjacent districts. The community and Council continue to examine this draft and make adjustments. The district plan would be reexamined periodically to monitor what’s working well and what needs improving. To encourage reinvestment in properties within the study area, the Town provided $8.8 million in transportation improvements. These would be implemented over multiple phases to address bicycles, pedestrians, cars and transit issues. The improvements stem from a traffic study and the Ephesus Church-Fordham Small Area Plan/Traffic Analysis that were completed in 2010, as well as continued input from residents. The recommended improvements support the Town’s Complete Streets Policy, which addresses issues such as traffic calming, street design, landscaping, lighting and utilities to better enable safe access for all users – pedestrian, bicyclists, motorists and transit riders. The transportation improvements will improve bicycle and pedestrian access throughout the Ephesus-Fordham district. “These improvements will offer more choices by expanding connectivity, so there isn’t just one way to go somewhere,” said David Bonk, the Town of Chapel Hill’s long range and transportation planning manager. “We also need to address pedestrian crossings and bike lanes, as well as incorporate green space so that we promote placemaking through the development of pocket parks and plazas. We will work with the developers to assist them in incorporating these elements into the design of their projects. The Ephesus-Fordham Renewal proposal acknowledges that the area is prone to flooding and water quality problems. About 4,000 acres of the Booker Creek watershed drains to this area via Booker Creek, which runs under The Shops at Eastgate, past Elliott Road, Fordham Boulevard and Willow Drive to Little Creek, and eventually the water flows into Jordan Lake. Since 2003, the Town required higher flow rate and volume reduction controls for new development and redevelopment projects. However, most of the existing development in the Ephesus-Fordham area and the Booker Creek watershed was constructed prior to implementation of the Town’s current stormwater regulations. This means most of the developments have little if any stormwater controls. “In the 1950s, ‘60s and ‘70s, Orange County permitted houses to be built in and near a floodplain without any stormwater controls,” said Chris Jensen, a stormwater engineer with the Town of Chapel Hill. About 57 percent of the Ephesus-Fordham area is impervious. Estimates for the new development district predict this will increase by 5 to 11 percent over the next 20 years. To help address existing water quality and water quantity issues, the Town’s current stormwater regulations are being implemented in the district as well as applying the Jordan nutrient treatment requirements to sites that do not increase impervious surface as a result of redevelopment. Current land use management rules do not require this higher level of stormwater protections. This approach is a component of the draft Chapel Hill Stormwater Management Program Master Plan, a townwide master plan. The Council will open a public hearing on April 21 to receive public comment on the master plan. Drafting technical standards and requirements for redevelopment and new development to be included in the Form Based Code. Developing higher technical standards than the rest of the town for water quality treatment. If approved, this area would have the most stringent stormwater management regulations in Town. Implementing recommendations in the draft Chapel Hill Stormwater Management Program Master Plan to complete subwatershed studies that look at the watershed as a whole to identify and review drainage problems, assess flooding and water quality issues, and develop integrated subwatershed plans for improvements to infrastructure as well as water quality capital improvements. Creating a district stormwater model that engineers will use to study the expected impact of the redevelopment. As redevelopment occurs over time the model can be updated to replace modeling assumptions with actual redevelopment data. In an effort to increase the community’s supply of affordable rental housing, the Town of Chapel Hill is partnering with a Raleigh nonprofit to create an affordable housing development on Legion Road. The project is one part of the Ephesus Fordham Renewal effort. DHIC Inc. plans to create two rental communities – Greenfield Place, 84 apartments for working families, and Greenfield Commons, about 60 units for senior citizens. The 8.5 acre property is located on an undeveloped portion of the Chapel Hill Memorial Cemetery off Legion Road. Next steps include establishing an access easement and to initiate subdivision of the property. An additional 1.5 acres adjacent to this site has been reserved for a future fire station. The Chapel Hill 2020 Plan and the 2011 Affordable Housing Strategy set a goal to create a range of housing options for current and future residents. Partnering with nonprofit housing providers like DHIC to develop a low income housing tax credit project on Town-owned land was the top recommendation identified in the Affordable Rental Housing Strategy adopted by the Council in February 2014. Many of the people who work in Chapel Hill cannot afford to live here. About 22 percent of the Town of Chapel Hill’s employees live in Chapel Hill zip codes. At UNC-Chapel Hill, less than half of the workforce lives in Orange County (49 percent of 11,900 employees). Of the 10,147 employees at UNC Health Care, about 18 percent live in Chapel Hill zip codes. The largest number of Health Care employees report living in Durham County. Similarly for the Chapel Hill-Carrboro City Schools, less than half -- 46 percent of the 2,112 employees -- live in Chapel Hill or Carrboro. Chapel Hill is looking for opportunities to expand and diversify the local tax base because a healthy mix of commercial, retail and residential uses on development directly benefits the community as a whole and the people who live here. This is a key part of the Town’s Economic Development Strategy. Based on expected development scenarios, conservative to moderate estimations of new tax revenue from the Ephesus-Fordham project range from $26.5 million to $47 million over the next 20 years, said Ken Pennoyer, the Town of Chapel Hill’s business management director. This will expand the tax base and reduce pressure for tax increases on existing properties. In Chapel Hill, about 18 percent of Town revenue is generated by the commercial tax base, which is lower than our neighbors such as Durham that relies on a 40 percent commercial tax base, or Raleigh with 35 percent. The lack of retail here means that we go elsewhere to shop. The number cited by Bassett is found in the 2013 Community Survey. The survey also shows a growing dissatisfaction in the growth of retail and access to quality shopping. Sixty percent of residents surveyed said that the pace of development for retail is “slow or much too slow” – an increase of 17 percent from 2009. Based on expected redevelopment, the Ephesus-Fordham Renewal will generate an estimated $26.5 million (conservative estimate) to $47 million (moderate estimate) over the next 20 years to benefit the Town, the County, and the Schools -- and ultimately, help reduce the pressure for future tax increases. The Town proposes to finance the $10 million worth of improvements for Ephesus-Fordham Renewal by coordinating the financing with other Town projects that can provide collateral for a combined financing. The Town is planning on using the incremental increase in the tax revenues generated from expected development to repay the debt. By using this method of debt repayment the project’s public improvements are essentially self-financed by the expected growth in taxes. The Town has requested that Orange County consider contributing a portion of the County’s tax revenue from the redevelopment to help pay the annual debt service, a contribution of up to $400,000 a year. This request leaves untouched the additional County tax revenue for the project dedicated to schools.This will help the Town pay the anticipated $800,000 of debt each year to fund the improvements. Based on expected redevelopment the County would receive additional property taxes of about $2.25 million annually after the project’s full build-out in 15 years. The Schools, based on expected development, would receive an annual tax increment of about $549,000after the 15- year build-out. In addition the Schools would receive one-time School Impact fees of about $1.92 million based on the addition of 1,495 additional multi-family housing units added during the 15 year-build-out period. These estimates are based on current tax rates and impact fee structure. “The County’s participation creates a very strong, marketable debt structure,” Pennoyer said. There will be a time gap between when the Town expects to issue the debt and when the redevelopment will begin to generate a tax increment sufficient to pay the debt service. To the extent possible, the Town will structure the debt for the Ephesus Fordham Public Improvements to defer debt payments to match the anticipated timing of incremental tax revenues. The Town of Chapel Hill has been working for several years on the renewal of this area. Following numerous public input sessions, the Council adopted the Ephesus Church Road-Fordham Small Area Plan in June 2011. In 2012, Town staff began to study and consider the use of form-based codes, an idea that evolved from the Chapel Hill 2020 visioning process and eventual comprehensive plan. A collaborative team of staff members from planning, stormwater, engineering, traffic, transit, finance and economic development areas has moved the renewal proposal forward. Beyond the internal team, professional consultants are working on technical challenges. The team is also working closely with the Chapel Hill Carrboro Public Schools, Orange County, Orange Water and Sewer Authority (OWASA), and Chapel Hill Transit on a cost/benefit analysis to better understand future impacts of the plan on the community. Visit www.townofchapelhill.org/ephesusfordham and click on the “Schedule” button to see where we are today in this process. © 2018 Town of Chapel Hill, NC. All Rights Reserved.